The death of Thomas Ince just after his 42nd birthday party was as improbable as the plot of some of the movies he produced. Born into a show business family on Nov. 16, 1882 in Newport, R.I., Ince rose from failure as a stage actor to success as the first film tycoon. He pioneered the system of moviemaking still in use today before he was carried off a yacht owned by newspaper mogul William Randolph Hearst, allegedly to be hospitalized for indigestion. Thomas Ince died several days later, his body immediately cremated. Even before the funeral, suspicions mounted about his death. Hearst believed his mistress, Marion Davies, and Charlie Chaplin were having a love affair. Davies and Chaplin had joined them on the boat, and rumors surfaced that Hearst actually shot Thomas Ince by accident, intending to shoot Davies, Chaplin or both. Thomas Ince started in show business at age 6, made his Broadway debut at 15 and then formed an unsuccessful vaudeville company. He talked his way into a job with a small independent film company in 1910, and went to Cuba to make movies. But only in Hollywood could Thomas Ince make the films he yearned to make: westerns and Civil War dramas. He borrowed a suit from a friend and a large diamond ring from a jeweler and walked into the offices of the New York Motion Picture Company. The firm had opened a studio to make westerns on the West Coast. He was hired. Thomas Ince, his young wife Nell and a small entourage went to Edendale, Calif., to make films. There he began to revolutionize moviemaking, inventing the shooting script. He then acquired land and created the first movie studio, called Inceville. It had sound stages, offices, sets, dressing rooms and a commissary. Thomas Ince hired a Wild West show, replete with cowboys, cattle and Indians who set up their teepees on the property. The teepees sat cheek-by-jowl with a fake Swiss landscape, a Japanese village, a Puritan settlement, mansions and cottages. Ince went on to organize production methods, putting the producer in charge of the film instead of the director and cameraman. He also invented the five-reel film when two reels were the standard of the day. 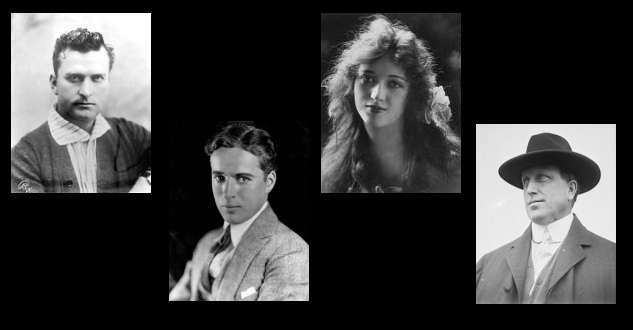 Fires eventually destroyed Inceville, and Thomas Ince created Triangle Studios with Mack Sennett and D.W. Griffith. Three years later he founded the studios in Culver City that would become MGM. On that lot would later be filmed such classics as Gone with the Wind, King Kong, Lassie and Citizen Kane. Thomas Ince sold out a few years later and formed Paramount Pictures with Adolph Zukor. Then he moved on to form his own studio again. At Thomas H. Ince Studios he made a few memorable films, Anna Christie and Human Wreckage, but he lost power and influence to competing studios. By 1924, the rumor mill had Thomas Ince edging toward bankruptcy. Supposedly he wanted to make a deal with Hearst to rescue his floundering fortunes. On November 16 he boarded Hearst’s lavish yacht The Oneida as a guest of honor – it was his 42nd birthday. Chaplin, Davies, newspaper columnist Louella Parsons and actress Elinor Glynn also boarded the yacht. They celebrated his birthday at dinner, and sometime afterward he suffered acute indigestion – or so the story goes. A physician aboard the yacht, Dr. Goodman, diagnosed Ince as extremely ill. A water taxi took him ashore and a train took him to Los Angeles. Ince got worse on the train and was taken off it at Del Mar, where he was treated at a hotel. He went home the next day, November 19, and died. The death certificate said he died of heart failure. But the front page of the Los Angeles Times ran headlines that said, “Movie Producer Shot on Hearst Yacht.” Those headlines soon disappeared, and the Hearst newspapers reported Ince had taken ill at Hearst’s home, San Simeon. A secretary aboard the yacht said he saw Ince bleeding from a bullet wound to the head. Ince’s body was quickly cremated and his wife, Nell, went to Europe. Rumors proliferated about what really happened: Hearst caught Chaplin and Davies in a compromising position and shot Ince by accident; Hearst poisoned Ince; an assassin hired by Hearst killed Ince; Hearst stabbed Ince in the heart with a hatpin. Adding to the confusion were the lies and denials told by Hearst’s guests – as well as evidence Hearst tried to silence Ince’s wife with a trust fund and Louella Parsons with a lifetime job. The most plausible theory is believed to be that Thomas Ince died from a bullet meant for Chaplin, but we will no doubt never know the truth. The story has lived on, in a mystery written by Hearst’s granddaughter Patty and in a film called Cat’s Meow. This story was updated in 2108. If you enjoyed reading it, you may also want to read about Varick Frissell and his deadly film here.